China’s expanded business activity in the service sector in June shows the effect of restructuring as the economy moves away from reliance on manufacturing. The Purchasing Managers’ Index for the service sector rose to an 11-month high of 52.7 in June, up from 51.2 in May, according to a survey conducted by Caixin Media Co and Markit, a financial information service provider. A reading above 50 indicates expansion, while a reading below 50 means contraction. “A month-on-month ticking up of PMI in the service sector shows China’s progress of restructuring,” said Niu Li, director of macroeconomics at the State Information Center, adding that the good performance in the service sector has offset some negative impacts on the economy from the flagging manufacturing sector. The PMI in the manufacturing sector dropped to 48.6 in June from 49.2 in May, earlier data showed. The private survey results track the trend indicated by official data released earlier this month, which showed service sector PMI rising from 53.1 in May to 53.7 in June, as the manufacturing sector dropped from 50.1 in May to 50 in June. Niu said the service sector is expected to continue to grow in the near future, and he cannot rule out the possibility that manufacturing would continue to contract. Xie Yaxuan, chief economist at China Merchants Securities Co, said despite positive signals provided by the service sector, the government should take more measures to boost supply-side reform to keep economic growth within the targeted 6.5 to 7 percent range. Gao Yuwei, a researcher at the Institute of International Finance, a think tank under the Bank of China, said the government should seek more ways to boost social financing, as uncertainties are expected to rise in the global market in the second half of the year. “Stimulus efforts such as interest rate cuts would not help a lot when both domestic and international demand remain weak,” Gao said. The People’s Bank of China, the nation’s central bank, pledged to maintain a prudent monetary policy and keep it neither too loose nor too tight, according a statement released on its website on July 4. 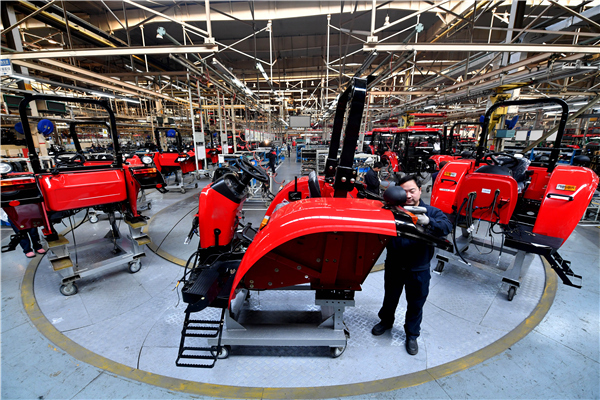 China’s GDP expanded 6.7 percent year-on-year in the first quarter of this year, within the official target range.